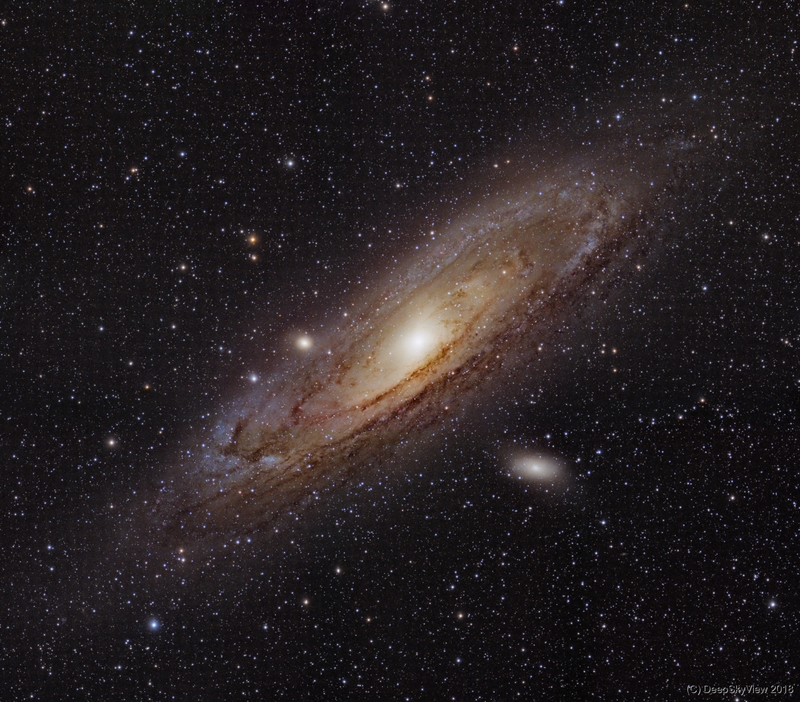 The Andromeda Galaxy M31 a truly magnificent sight. It is the sister of our own galaxy and the closest major galaxy. Our Milky Way, the Andromeda Galaxy, the Triangulum Galaxy M33 are members of the Local Group. M31 contains about 1 trillion stars, twice as many as our home galaxy. It’s not only one of the brightest Messier objects it is also quite large… six times the full moon in diameter. This image is an experiment in several ways: It is a six-panel mosaic with a whooping 50 mega-pixels of final data – here I only show a down-sampled version with 25% of the pixels. Nevertheless, I shot this image within one short night at the Sternenwelt Vogelsberg using a minimal amount of RGB data, i.e., only two 120sec subs for each color channel and panel. For luminance I used 24 subs with 60 sec exposure time each, also not much. All in all less than 4 hours of data! Everything relies on the sensitivity of the QHY 163m and some luck with processing. This experiment worked out very nicely, I think.